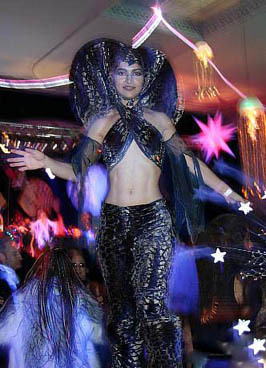 This New Year's Eve 2005, ANON SALON will once again raise their highly successful and magical SEA of DREAMS NYE event in SAN FRANCISCO. 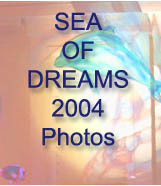 This year however, ANON SALON, for the first time, will also produce a parallel SEA of DREAMS NYE event in LOS ANGELES. Both events will take place in equally elegant and historic venues: the SF REGENCY CENTER in San Francisco and the PARK PLAZA in downtown Los Angeles. 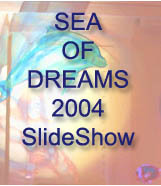 SEA of DREAMS is not your average New Year's event. It is rather a multi-media cross-disciplinary extravaganza that draws artists, performers and partygoers from a wide variety of creative communities and age groups together in the creation of a completely unique event experience. Their San Francisco events have provided a showcase for the amazing spectrum of talent that resides in the Bay Area. The Los Angeles event will take a similar approach, teaming up with many Southern California colleagues and friends who have helped make the Northern California events such a huge success for the past three years. 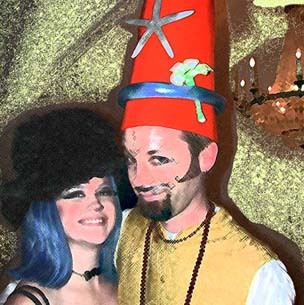 For over twenty years, ANON SALON has shaped West Coast entertainment history by producing hundreds of events; unique theme parties, theater festivals, gallery shows, technology conferences and even street fairs for Burning Man fans both in San Francisco and Los Angeles. Largely unadvertised, but annually sold out, their New Year's SEA of DREAMS is one of the most lavish multi-media events of the year. Past year's performers have included ANON musical favorites; SOUND TRIBE SECTOR 9, HAMSA LILA, LOST AT LAST, MUTAYTOR, UK DJ FREQ NASTY, ELLEN FERRATO, LORIN, WICKED DJ'S GARTH and JENÖ, along with a host of other live bands, DJs, circus acts, cabaret and performance artists, interactive installations woven around the predominantly costumed revelers that are the signature touch of ANON SALON events. The rules of raising events have changed dramatically in the past several years. The result is the rise of a new type of event, one which joins media-savvy producers with their local communities to raise a new wave of non-commercial, unadvertised (except by e-mail) single events and large public gatherings. Intensely collaborative and technologically cutting edge, such events generally serve their particular theme by featuring music and performance artists within the context of theme specific decor, live art installations, lighting and video displays, walk-around theatrics and participatory activities. It is the costumed participants who through their own interaction actually provide the finishing artistic touches to the event. At the forefront of this entertainment evolution has been ANON SALON, respected pioneers and acknowledged trend setters of the genre. BURNING MAN may have coined the motto "no spectators", but it is groups like ANON SALON, in the context of their expanding networks of communities, that keep that ideal alive year-round. Artistically, ANON SALON builds on the long cross-disciplinary and avant-garde tradition. In San Francisco, event producers JOEGH BULLOCK, MARCIA CROSBY and MARK "SPOONMAN" PETRAKIS have been blurring the line between performer and audience for close to 25 years, along the way reflecting the changing face of San Francisco's most adventurous and creative enclaves. These three original partners in ANON SALON have been central to the alternative and underground art scene since the early 1980's. Collectively, they raised giant GLASHAUS parties in the 1980's, COBRA LOUNGE art vaudeville shows, the ICON BYTE BAR AND GRILL (the first Internet bar and cafe in SF), the award-winning CLIMATE THEATER, the world famous SOLO MIO PERFORMANCE FESTIVAL and FESTIVAL FANTOCCHIO OF NEW PUPPETRY. 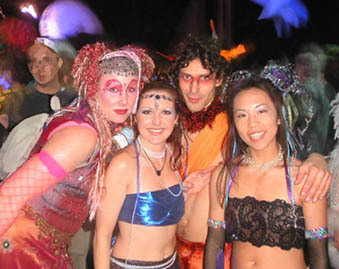 Besides producing the first official website for BURNING MAN, they also initiated San Francisco-based BURNING MAN parties called FLAMBÉ LOUNGES as well as the annual DECOMPRESSION and HEAT THE STREETS STREET FaIRES. 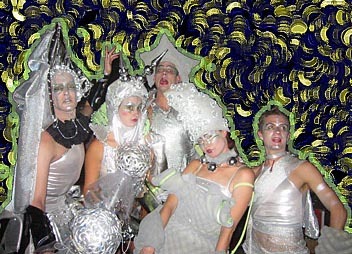 In the early 1990's, Joegh and Marcia merged with Petrakis' production group, pARTy/SCIENCE for the purpose of uniting the Bay Area art and technology communities in what proved to be immensely successful monthly "party/event/ performances" known as ANON SALON. Throughout this period, pARTy/SCIENCE also provided story and live event and conference consultant services to a host of corporations and research organizations. Artist and concert producer MARK BAVA, from the Monterey Bay area, joined the mix in 1999. Soon after that, the first SEA of DREAMS NYE events were born. Now a Los Angeles resident, Mark Bava is co-owner of LITTLE PEDRO'S/BLUE BONGO CAFE and co-producer of the DOWNTOWN L.A. ARTIST SOAP BOX DERBY and the L.A. BURNING MAN STREET FAIR, to be held this year on October 16, 2004. "ANON SALON teases technology, embraces the arts, and flirts with the unknown. It celebrates all that's eclectic and electric in art, design, and media providing a place to grab new ideas before business as usual turns them into formulas. Fine art and found art, videophones and finger paint, didgeridoos and radio-controlled MIDI floors, spoken word poetry and a life drawing class, all have their place in the larger mix." "We originally called this a salon to tell people that we weren't intending to just throw a party, that we really expected people to come here with their art brain turned on...the idea from the beginning was to use art as the ice-breaker; stimulating conversation, creativity, and people. The secret is to make the event itself a work of art [so that] each guest becomes a participant, a part of the art, whether they realize it or not." ANON SALON surrounds the guest with an array of possibilities, allowing them the opportunity to alter the very nature of the event - the point being that the combination of all these elements creates a "safe zone" in which the partygoers can easily segue between voyeurs and celebrants. This New Year's Eve, party history will be made, as ANON SALON once again combine their talents and experience to stretch the boundaries, as they light up the two hottest spots on the West Coast in an ANON SALON style celebration - two separate cities, two separate and beautiful venues, with two separate and singularly spectacular events.